(January 5, 2011 – New York, NY) Recently, the name of DiBella Entertainment’s grand champion Sergio Martinez has been turning up left and right, as publication after publication name their 2010 Fighter of the Year. But also getting some ink are two young super middleweights in the DiBella Entertainment (“DBE”) stable: Edwin “La Bomba” Rodriguez (17-0, 13 KOs) and Marcus “Too Much” Johnson (20-0, 15 KOs), as they have both been recognized as top prospects to keep an eye on in 2011 by various media outlets. 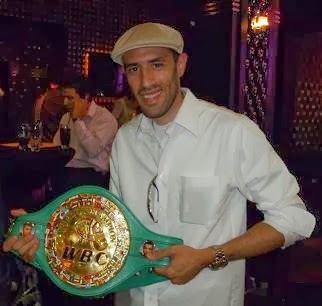 Rodriguez was active in 2010, going 4-0 with each of his wins coming by way of knockout. He made his debut on ESPN2’s Friday Night Fights in March with a first round knockout of normally rugged veteran George Armenta, and then made his ShoBox debut in April with a six round drubbing of Kevin Engel. Both those wins came via body shot. He closed the year by capturing the WBC USNBC title with a ninth round stoppage of James McGirt, Jr. on ShoBox. Johnson fought twice in the year, both on Showtime’s ShoBox series. In April, he decisively beat previously unbeaten Derek Edwards, winning a twelve-round decision. He followed up that performance with an impressive third round stoppage on hard-nosed Kevin Engel in November. Peter Czymbor of 8countnews gave Rodriguez his New England Fighter of the Year honors, for living up to his billing despite being the “most hyped amateur turned pro to come out of the region in years.” He even suggested a showdown between Rodriguez and Johnson.